For 15 years, a young Chinese man was called a video game addict. He was looked down upon because of his hobby. But now, 15 years later, he's been vindicated. He's now an manager for a e-sports club in China. IFeng.com brings us the story from the Chongqing Evening Post of 22 year-old Li Yang and how he went from "addict" to pro. Li, through his hard work, dedication, and skill is now a manager of an e-sports club in Shanghai—these clubs are places where gamers can train and learn how to play games, being taught by "professionals." Li, originally from Chongqing, used to play a lot of video games. He told reporters that he first got into gaming when he was seven. He was introduced to video games through his cousins. They would play StarCraft together. After being enthralled by the world of video games, Li started doing poorly in school. Li blamed it on his passion, that he was spending more energy on gaming than on studying. Even though he said his grades weren't the best, Li developed a fascination with art and animation, landing him a spot at a university in Guizhou. There, Li started playing League of Legends, which slowly began to affect his school work. Despite the drop in grades, Li won a provincial tournament. Perhaps it was foresight, perhaps it was luck, but in 2013, after graduating from university, Li decided to start an online game training studio. Borrowing money from his mother and taking what he had saved up from training people online, Li started his studio. He enlisted 5 students who each agreed to pay him 300-400 RMB per lesson—that's about $48 - 65. 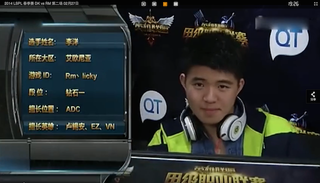 On top of training gamers on how to play games such as LoL professionally, Li also did online commentating. He would comment on games, sometimes even live matches. At one point Li had so much on his plate that he "franchised" out his training business to friends, taking a 30 percent cut from their profits. In March of last year, Li met a man from Shanghai online. The two hit it off and decided to meet in person. While traveling to Shanghai on vacation, Li met up with the man. It turned out that the man he met was a businessman and wanted to invest in the game industry. The two talked it out and in the end, Li was offered a job as a manager for an e-sports club in Shanghai. Li now makes about $1,948 a month, which is considered good in China. Room and board are covered by his company. Li oversees about 40 different people. Li laments the sad truths of professional gaming, "For professional gamers, they peak when they're about 17 or 18, and they need to have luck and skill." Li said. "I played 15 years of games, and I can't say that I made it. I'm lucky to be here, if it wasn't for the heavenly gifts that I was bestowed, I wouldn't be here." Li's tale is an interesting one. China's attitudes towards gaming (and pro-gaming) is slowly changing. IFeng points out that since the Dota 2 International and its ridiculous prize, more people have become interested in pro-gaming. In an interview with Sina back in July, Team Newbee manager Tong Xin spoke about how parents used to tell their kids not get into pro-gaming, but now are trying to get managers to train their kids. Tong's statements mirror what Li is saying—that professional gaming takes skill and luck.